This plumbing traps (interceptors) article describes plumbing traps (interceptors) and how to diagnose, find, and cure odors in buildings including septic or sewage or sewer gas smells or "gas odors" in buildings with a focus on homes with a private onsite septic tank but including tips for owners whose home is connected to a sewer system as well. We describe the common problems that occur at plumbing traps: odors, leaks, noises, and we discuss plumbing trap types, requirements, locations, connections, installation, repair and replacement. This article distinguishes between P-traps and older S-traps and explains trap siphonage and the dangers that can result from dry plumbing traps. 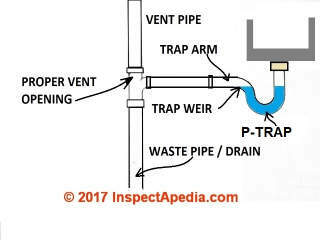 A plumbing trap is a U-shaped bent building plumbing drain component whose job is to maintain a water seal to keep sewer gases from rising back up into the building from the building's sewer drain piping system. Watch out: Improperly installed, damaged, leaky, or missing plumbing drain traps can release smelly and even dangerous sewer gas odors in the building. Our photo (left) shows a plumbing trap that was abandoned in a building basement. The chopped-off, open drain line combined with eventual dry-out of the water in the plumbing trap shown will provide a ready path for sewer gases to enter the structure - a sanitary hazard and even an explosion hazard. This article series describes both plumbing drain traps and how properly-installed traps or interceptors should prevent or cure sewer gas odors from septic systems, building plumbing, & similar sources. Checklists in this article series will help with sewer gas smell diagnosis or septic gas smell diagnosis. Other causes of sewage odors, septic odors, sewer gas, rotten egg, or other indoor gas odors are also described. 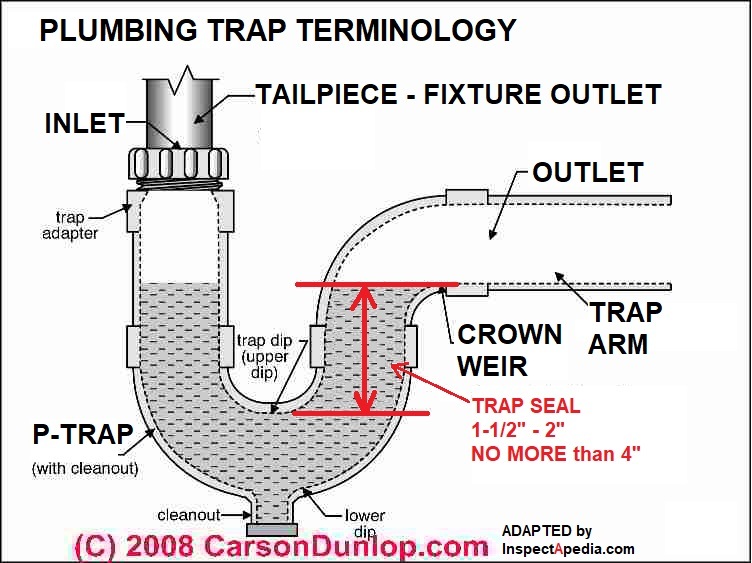 The page top sketch of the detailed parts of a plumbing trap was provided courtesy of Carson Dunlop Associates, a Toronto home inspection, education, & report writing company. Clogged or blocked plumbing traps can cause leakage, and organic debris in plumbing traps may itself be a source of odors which people mistake for sewer gas backups. If your drains are slow at only certain fixtures one of the first things to check is for clogging of the individual fixture traps. 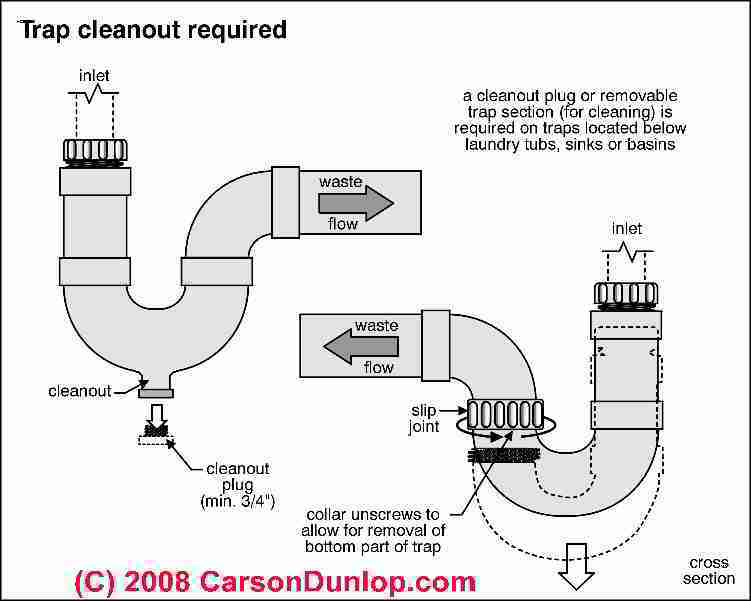 As Carson Dunlop's sketch shows, some fixtures such as laundry sinks are required to have traps which include a cleanout plug, making cleaning of the trap easier. Otherwise you'll have to remove the entire plumbing trap to clean it. Definition: What's the difference between Plumbing Traps vs Plumbing Interceptors? Note: recent changes in plumbing codes including ASME Standards, the Uniform Plumbing Code (UPC), Canadian Standards Association (CSA) and the International Plumbing Code (IPC) have dropped the term plumbing trap, and substitute a more inclusive word, "interceptor". In this usage, sewer gases are "intercepted" or prevented from entering the building from the drain system. In some building codes and plumbing texts you will see increased use of the term interceptor where you may be more familiar with the term plumbing trap. In particular, grease traps are referred to now as hydromechanical grease interceptors or gravity grease interceptors. 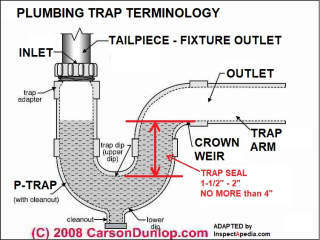 Definition of Dry Plumbing Traps: a dry trap is a plumbing trap or interceptor that has lost its water seal, thus permitting sewer gases to escape back up building drain piping and out into the building through the fixture - an unsafe, unsanitary, and potentially dangerous condition. When a plumbing trap remains un-used for a long time the water can simply evaporate from the trap, permitting sewer gases to back up into the building. Watch out: Because sewer gas contains methane gas (CH4) there is a risk of an explosion hazard or even fatal asphyxiation. Basement floor drains often become sources of sewer odors because they remain unused and dry out. Backdrafting caused by exhaust fans used in tight buildings can sometimes both draw sewer gases out of a dry plumbing trap or other drain piping leaks and may move such odors through the building. Watch out: backdrafting in buildings is more than a bad smell problem as it may cause unsafe back-drafting of combustion products and carbon monoxide into the occupied space - potentially fatal hazards. Buildings in which the plumbing vent system is incomplete, missing, or improperly constructed. Improper plumbing vents or absence or clogging of a vent system can cause plumbing trap siphonage: water flowing down the building drain line can siphon or "pull" the water seal out of plumbing traps. Pour clean mineral oil into the trap when the building is to remain unoccupied for a month or longer. Simply pouring enough clean mineral oil into the trap to fill the trap bottom is an effective preventive measure and mineral oil in small quantities won't harm a septic or sewer system. Mineral oil will not evaporate, even over months of trap disuse. Pour food-grade antifreeze into the plumbing trap. When winterizing a building where traps are left in place they may be filled with food-grade antifreeze. 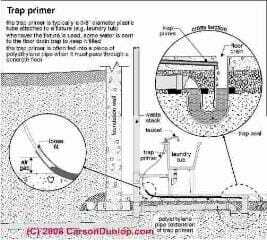 Use o a trap primer to keep a water charge in the plumbing trap. 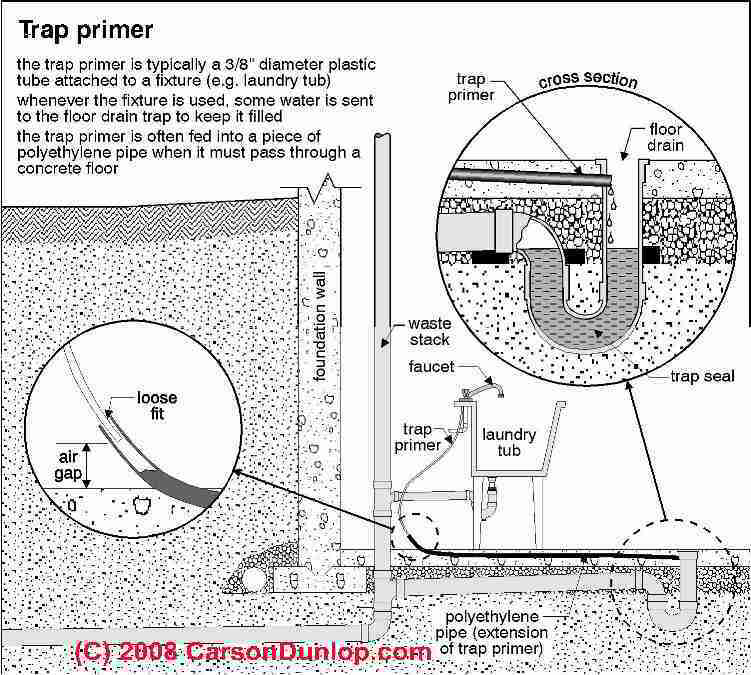 Carson Dunlop Associates' sketch at above left shows how a trap primer system can be installed from a laundry tub. Self-sealing plumbing traps (interceptors) containing check valves are available and are suited for floor drains. If water on the floor needs to escape it can flow out of the trapped floor drain, but the trap contains a mechanical seal which prevents sewer gas backups even if the floor drain trap is dry. There is no actual plumbing trap in the waste pipe immediately below a toilet. Toilet bowls are themselves in effect the largest plumbing trap in most buildings. The water in the toilet bowl is providing the trap seal that prevents sewer gases from rising up the drain piping and exiting through the toilet base into the building. So if the toilet bowl is dry - from many months of no use (or more rare, from leaks at a cracked toilet bowl) then sewer gases can indeed enter the building through the toilet. We might prevent this hazard at an un-used toilet by pouring clean mineral oil into the toilet bowl just enough to fill the bottom trap weir. But toilets can still leak sewer gases into a building if the toilet is or has been loose or if the toilet base was not properly sealed to the waste pipe. Check your toilets for leaks at the toilet base. The wax ring used to seal the toilet base to the waste pipe at the floor may be deteriorated or leaky, especially if the toilet is loose or was previously loose. A wobbly toilet compresses the wax ring seal, leading to leaks and sewer gas odors in the bathroom. In the photograph shown here, stains around the toilet base suggested that this toilet had been leaking at its base - a condition both unsanitary and smelly. Straddle the toilet and gently pinch it between your knees. Then gently push on each side of the toilet to see if it moves. If the toilet moves it may be leaking into the floor (and ceiling below) - an unsanitary condition. The toilet needs to be removed, any damaged floor repaired, and then the toilet is TOILET is REINSTALLED [photo] using a new WAX TOILET SEAL RING [image] before bolting it securely to the floor. Details about how to fix a loose or leaky toilet are at LOOSE TOILET REPAIRS. This discussion has moved to PLUMBING TRAP MATERIALS & PROPERTIES. Plumbing traps are constructed of any of a number of old traditional materials, principally metals, occasionally wood, or of newer plastic materials. That photo series can identify the type of plumbing trap or interceptor material in a building. S-traps are often installed in older buildings where there is no venting provided for that plumbing fixture. S-traps easily lose the water from the plumbing trap, especially if the S-trapped fixture is near a toilet or other large plumbing fixture. 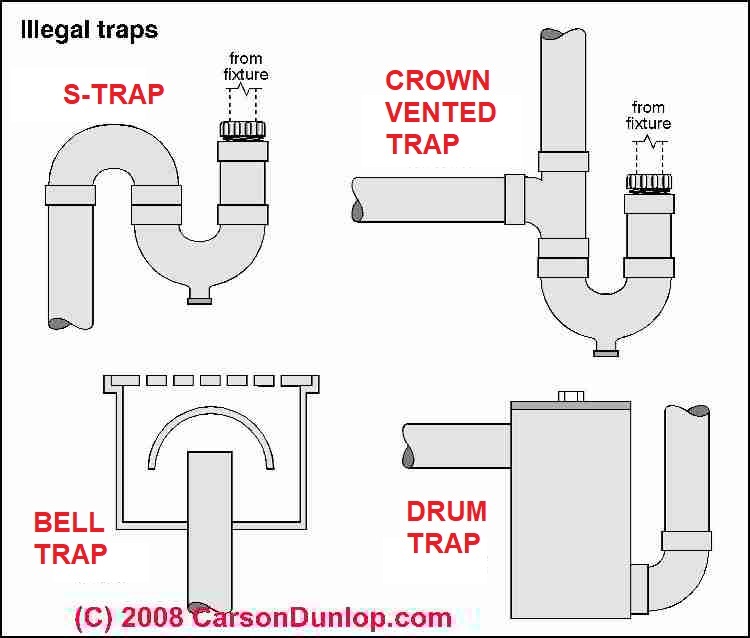 Carson Dunlop Associates' sketch at left shows several types of illegal plumbing traps including the "S" trap. When the larger fixture is draining, the sudden and large volume of water rushing down the drain creates a vacuum in the drain line that can siphon water out of the nearby plumbing traps. When a plumbing trap has lost its water seal, sewer gases pass readily back into the building. Look below the sinks for antiquated or un-vented drains - if you see an "S" trap rather than a modern "P" shaped plumbing drain trap, the fixture is almost certainly not properly vented. Don't forget to check for smells at your garbage disposer drain too. 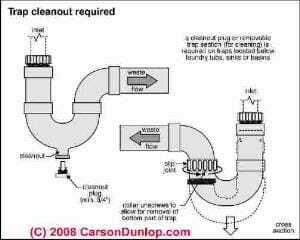 And in buildings where GREASE INTERCEPTORS TRAPS or grease interceptor is installed, the garbage disposer (food grinder) drainage is required to bypass the grease trap. This requirement is notwithstanding that garbage disposers (and the pre-rinse function of some dishwashers) is a substantial source of fats, oils, grease (FOG) that clog plumbing drain systems. If that is the odor source you may be able to remove the odor by cleaning liquids or even simple vinegar. Smelly and potentially explosive sewer gases are lighter than air and will rise up through plumbing drain or sewer systems unless these gases are blocked from entering the building. The two principal features that prevent sewer gases from entering a building through its plumbing drain system are water-filled plumbing traps [the blue area of the plumbing trap in our sketch] at sinks and tubs or other plumbing fixtures, and the building plumbing drain vent system [labeled in our sketch] that vents sewer gases above the building roof. The water trap is critical to keep sewer gases from rising from a sewer or even from a septic system back into the building. The blue area showing where water rests in the plumbing trap has a maximum allowable height of 4". But water must remain in this space to act as a seal. What makes the smell in sewer gas? Sewer gases are more than an obnoxious odor. 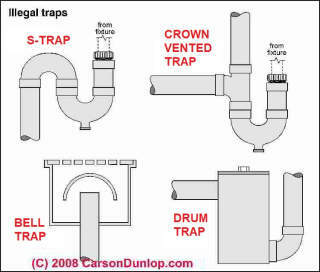 The page top schematic of a typical plumbing trap is courtesy of Carson Dunlop Associates'. Sewer gases also probably contain hydrogen sulfide gas (H2S) In addition some writers opine that there are possible health hazards from sewer gas exposure, such as a bacterial infection of the sinuses (which can occur due to any sinus irritation). ODORS GASES SMELLS, DIAGNOSIS & CURE where we describe how to track odors to their source or cause. Continue reading at PLUMBING TRAP LEAKS & MISSING INTERCEPTORS or select a topic from closely-related articles below, or see our complete INDEX to RELATED ARTICLES below. 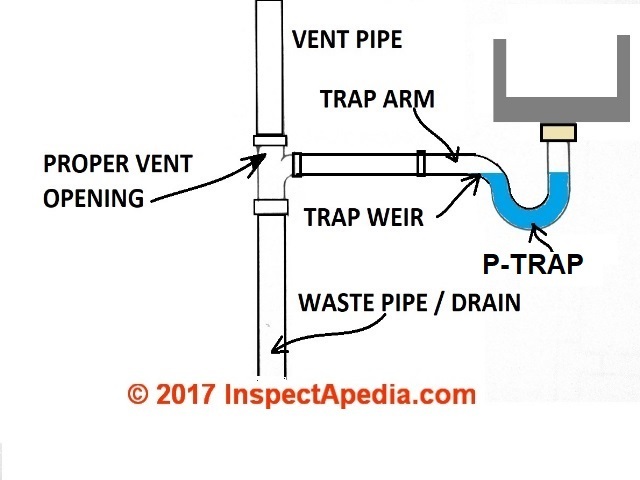 PLUMBING TRAPS & INTERCEPTORS at InspectApedia.com - online encyclopedia of building & environmental inspection, testing, diagnosis, repair, & problem prevention advice.